The opening ceremony of the highly anticipated 60th A. Le Coq Moonsund Regatta will launch a week’s worth of races and events today in Haapsalu. Estonia’s oldest and biggest regatta is celebrating its most respectable anniversary with more than 850 sailors on 144 boats from five countries: Russia, Latvia, Lithuania, Finland and Estonia. This year the regatta is more international than ever before – as many as 34 yachts out of 144 are from abroad: one from Finland, two from Lithuania, 14 from Latvia and 17 from Russia. There have never been so many foreign guests at this event before. Within one week the “sailing festival” will visit six harbours: Haapsalu, Kuivastu, Roomassaare, Kihnu, Pärnu, and Riga. If in 1958 the first regatta sailed from Riga to Haapsalu, then this year the race will begin in Haapsalu, Estonia, and finish in Riga, Latvia. The regatta will ascertain Estonian offshore champions in classes CDL £ 8 (small ORC yachts) and Folkboot. The winners will be awarded at the prize-giving ceremony on the 15th of July on Daugava in the centre of Riga. The anniversary of the Moonsund Regatta will also be highlighted by the Estonian Maritime Museum. On the 9th of July an open-air exhibition will be opened in the Old City Marina in cooperation with the Port of Tallinn and the regatta organisers and as of 04.07 there is an exhibition dedicated to the regatta in the Seaplane Harbour. It is worthy of noting that among other most interesting expositions (like, for example, a wind chamber where one can experience different winds) the Seaplane Harbour is displaying one of the very first cups of the regatta and also a Hai (lit. Shark), a keelboat used in the regatta of 1958, and other boat classes that used to race 60 years ago. The Seaplane Harbour is definitely a place worth visiting. The celebrations of the anniversary regatta will be kicked off with a procession of sailors and a brass band from Veskiviigi harbour to Haapsalu Kuursaal. The opening ceremony after-party with music and dancing is in Veskiviigi harbour and Grand Holm Marina. In order to stay in a reasonable time frame, this year the registration and measurement will open one day earlier, which is on Friday, 7th of July, and the start to the first leg will also be given earlier, on Saturday instead of the traditional Sunday. 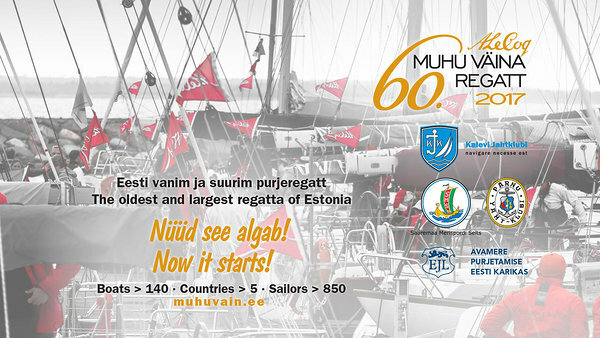 The first leg - Smarta.ee Haapsalu-Kuivastu race – will take the regatta to Kuivastu harbour on Muhu Island. Muhu will welcome the regatta with local entertainment and cuisine and everyone is also more than welcome to visit the Small Islands song festival in Hellamaa. On Sunday, 9th of July, the Mount Gay / Heimon Gourmet race finishes in Roomassaare on Saaremaa, where the regatta will stay for two days. Monday race is a local LoodusInvest circle, which will be ideal for spectators in Roomassaare. And of course, no day will go without entertainment. The shore program includes nostalgic video disco featuring hits on request and the hits of the 70s and the 80s. On Tuesday, 11th of July, the Dermoshop leg will finish in Kihnu. Kihnu harbour has seen a lot of renovations and welcomes the race with new piers and a fancy harbour building. Last year the evening in Kihnu was one of the biggest hits of the regatta’s shore program. Eesti Meedia leg on 12.07 will be a race from Kihnu to Pärnu. Pärnu has been fortunate enough to host the regatta every year and it is also a place with plenty to do and see. Upon arrival there will be a traditional mini-regatta and the evening will be entertained by Groupa Vocada from Latvia. 13th of July is for Danske Bank inshore races that can be observed on water, on shore and online (curtsey of Eesti Meedia and Postimees). The traditional regatta dinner will be held on Thursday evening at Pärnu Yacht Club. The festivities will also include a book presentation by Imre Aljas who sailed around the world and music will be brought to you by Swingers and DJ Tom Lilienthal. The longest race of the regatta – the OlyBet leg – starts on Friday in Pärnu and finishes in Riga late in the evening or at night. The brand new harbour on the island of Kipsala will be open for sailors and all guests of the regatta from Friday evening onwards. There will be no more races in Riga but in order to provide the city a visual feast, the entire fleet will have a fleet demonstration. The organisers of the regatta see introducing Estonia and the Estonian sailing traditions in Riga as their mission and the cultural program offers music by NOËP from Estonia and Keksi from Latvia. The long racing week will be concluded with the prize-giving ceremony on Saturday afternoon. The entire regatta can be followed online; all boats will be equipped with GPS-tracking systems. Also, all fans and guests of the regatta are welcome to take part in the harbour events – the entertainment program is free both for the sailors and visitors. Postimees has launched an online regatta page where you can follow all races, enjoy harbour programs, see the results, listen to interviews, browse photos, etc. We are also very pleased to introduce two new and useful services that are available this year. There will be a regatta truck by Volvo Trucks Estonia with a DSV trailer taking all gear from one port to the other. Also, on the last day of the regatta Go Bus will offer transport from Pärnu to Riga and back. Activities on the sea will be managed and heeded by the team of PRO Andres Talts. Protests and problems will be solved by protest committee chairman Alfredo Ricci from Italy, international match race judge and member of Kalev Yacht Club, who has just arrived from the 35th America’s Cup in Bermuda. Yachts are measured and checked by Arvet Tetsmann’s team and the race office is run by Krista Liiv. Regatta is supervised by regatta director Indrek Ilves and entertainment is brought to you by Andreas Lukin. Organising clubs are represented by Renè Allik, Raiko Lehtsalu and Rain Riim. All communication is managed by Piret Salmistu and Anneli Lepp is the chief of marketing. The A. 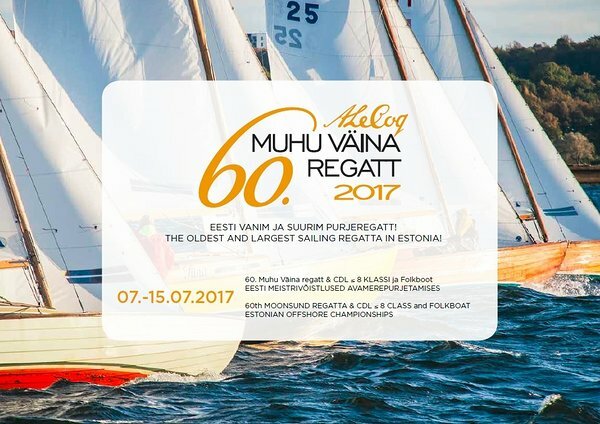 Le Coq Moonsund Regatta is organised by Kalev Yacht Club, Pärnu Yacht Club and Saaremaa Marine Sports Society in cooperation with the Estonian Yachting Union. The sponsors of the Moonsund Regatta are: A. Le Coq, Postimees/Eesti Meedia, Helly Hansen/Sportland, DSV, Dermoshop, LoodusInvest, OlyBet, Smarta.ee, Mount Gay, Danske Bank, COCO Active, Rahva Raamat, EAS, Euro Oil, Go Bus, Auto Forte, Haven Kakumäe, Estonian Maritime Rescue Organization, the cities of Haapsalu, Pärnu and Kuressaare, Kihnu Municipality, the Port of Riga. News and galleries: Postimehe portaali Purjetamine/Muhu Väina regatt alamlehel.